Prime Minister Stephen Harper was in Gormley today at the Whitchurch-Stouffville Museum to announce the New Building Canada Fund, which will provide $14 billion in funding for infrastructure projects. After an introduction by local MP Paul Calandra, Harper described the new 10-year infrastructure plan. "I am delighted to announce that the framework of our New Building Canada Plan is complete, and as a result provinces, territories and municipalities will now have unprecedented access to predictable, sustainable, federal infrastructure funds - for a decade," said Harper. 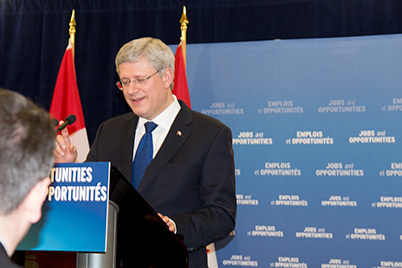 Harper noted that the new fund commits $1 billion to smaller communities that have populations under 100,000 residents. This money, he explained, will give smaller communities the same predictable access to funds that larger regions currently enjoy. Overall the New Building Canada Funds will be divided into two areas. Provinces and territories will have access to $10 billion, which includes the $1 billion earmarked for smaller communities and $9 billion for regional and national projects. Another $4 billion will be available for projects that meet federal priorities on the basis of their merit. "Okay the name may not be original," said Harper as he joked with attendees and the media, "but the money - $70 billion dollars if we count our own federal infrastructure investments - is new, or at least almost all of it is new." The Prime Minister also fielded questions from the media on several topics, including the recent conflict over whether to go ahead with the proposed income-splitting promise. Looking relaxed, Harper spent time after the announcement talking with local business owners, municipal political and other attendees. Local councilors in attendance included Susanne Hilton, Ken Ferdinands, Clyde Smith and Phil Bannon. Hugo Kroons, who narrowly lost his bid for the council seat in Ward 3 in the 2010 election, also attended.